Why Wouldn’t You Just Eat a REAL Apple? Q & A: What do you eat while traveling? Earlier I talked about Why you wouldn’t just eat an egg?, instead of a processed bowl of cereal full of sugar and GMO ingredients. I mentioned that we eat custard for breakfast or snacks and a few people requested recipes. The custard we eat is a bit different than what you may be used to since I make mine barely sweetened (it is breakfast after all). Most people view custard as a sweet treat, but it can be made very nourishing with a few tweaks. It is the ultimate simple nourishing breakfast, if made with eggs, milk, spices and the tiniest bit of natural sweetener. If your family members are sweet lovers, you can always give them an extra spoonful of maple syrup on top of the custard, but really do try to wean them off eating sweets for breakfast, even of the natural kind. If you simply like things sweeter, double the amount of maple syrup or honey in the recipe below. There are a few different options for making this custard. If you want to make it super quick, simply whisk all ingredients together, pour in dish or cups and bake. If you want extra flavor and nutrition, steep milk with vanilla beans and true or sweet cinnamon sticks*. Preheat oven to 325 F for dish or 350 for cups. If you want extra healthful and flavorful custard, steep milk with vanilla beans and cinnamon sticks (see below for sourcing for these). Whisk eggs, maple syrup, and vanilla if using in bowl, stir in milk. 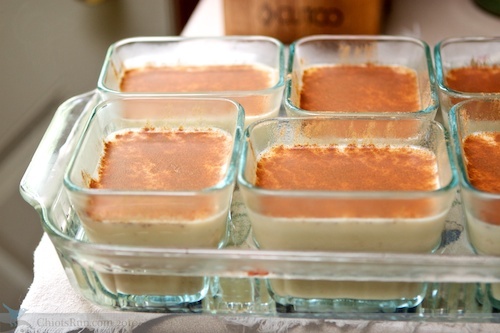 Pour into a glass baking dish or six custard cups. Sprinkle top with nutmeg or cinnamon if desired. Set the baking dish(es) in a pan of hot water, as you can see by my photo, I use 6 small Pyrex Rectangular Glass Containers nested in a rectangular glass baking dish for large single servings. Bake large dish at 325 degrees for 1 hour; bake cups at 350 degrees for 40 to 45 minutes. Custard is done when a knife inserted off-center comes out clean. Serve warm or cold, add an extra drizzle of maple syrup if you want it sweeter. 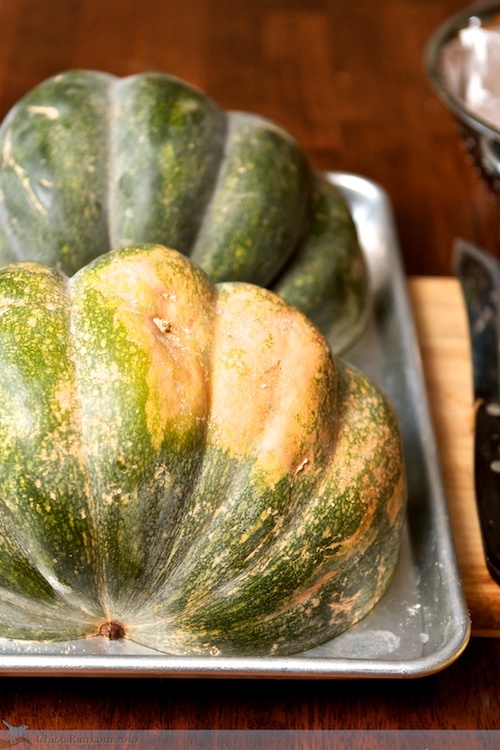 You can also make this even more healthful by adding some pumpkin to make pumpkin custard. Essentially all you need to do is swap out half the milk for pureed pumpkin. What a wonderful way to get a serving of vegetables first thing in the morning. What’s your favorite nourishing breakfast? *true or sweet cinnamon is different than the regular cinnamon you buy at the store (unless you have access to a hispanic store), it’s much sweeter, less cloying, and blends so much more beautifully with sweet dishes like this one. You can buy organic true cinnamon from Mountain Rose Herbs for a great price, I always have a big bag on hand. Cinnamon is a healthy addition to your diet, containing lots of manganese, calcium and iron. It also contains trace minerals that help regulate blood sugar. Here’s some great info on the health benefits of cinnamon. **Vanilla beans can be quite pricey in the grocery store, but if you buy in bulk from Saffron.com it’s very nicely priced. Vanilla is also a healthy addition to your diet adding a wide variety of minerals and vitamins, it’s a natural anti-depressant and it help you relax (good for nighttime beverages). Here’s a great article about the health benefits of vanilla. You can also rinse and dry vanilla beans after using them in this recipe and throw them in your sugar crock to impart flavor. Or add to a bottle of brandy, bourbon or vodka to make your own vanilla. I make a maple custard for the MiL’s birthday dessert, since she doesn’t eat cake and her birthday falls in April when we always have tons of syrup from the recent sugaring. Obviously, I use quite a bit more maple syrup, since it’s a dessert. It’s delicious. This sounds like a great breakfast, and a great way to use up the mass quantity of eggs I always end up with after visiting the in-laws. My favorite nourishing breakfast is a variation on shirred eggs: sauteed leeks topped with an egg and a little bit of cream, yum! I’ve made this a couple times and Isabella loved it both times! I can’t say I liked it, but I’m not much of an egg eater. But I’m always happy when my growing girl eats good fats and lots of protein. It’s funny, yesterday I dropped Isabella off in her Sunday School classroom, and the teacher said, “She always looks so healthy. If you lined up all the kids in the class, Isabella looks the healthiest.” I thought it was a really weird thing to say, but a generous compliment. That’s a wonderful compliment and yet a sad thing when you think about how malnourished all the other kids must be. Definitely a testament to you caring enough to feed her good food! This is a delicious breakfast! I have a major sweet tooth and have LOVED a sweet potato/egg combo lately, so I made this with 2.5 c sweet potato (roasted and pureed)and 2.5 c plain almond milk. Pulled it out of the oven a half hour ago and just tasted it — even with just a bit of maple syrup, it tastes like french toast! I am so excited for breakfast this week. Oh, that sounds wonderful too! What a great alternative for me since I dont eat wheat.. I started making custard because I couldn’t stand to waste any egg. 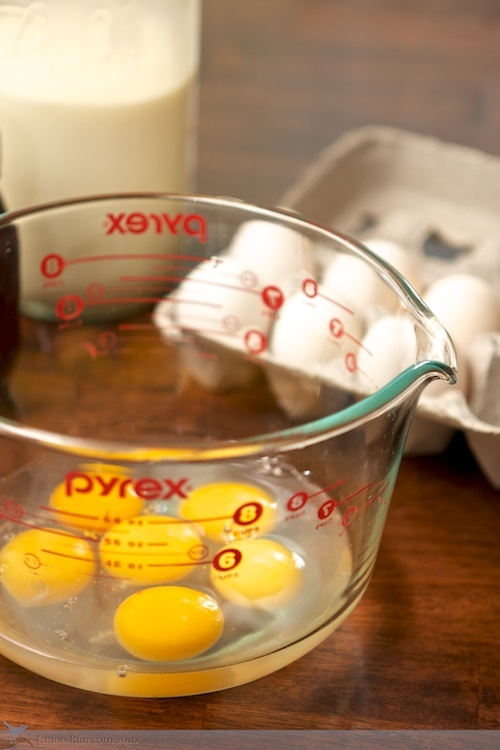 I make quiche fairly frequently, but the recipe I use calls for 4 eggs and 4 egg whites. My recipe for custard uses the egg yolks. We also have it for breakfast (with little sweetener). I think it’s a great way to make the most of what you’ve got. Custard is so easy and so tasty! Mine turned out runny. The sweetness was perfect, but instead of smooth, it was a little chunky and separated. Any ideas what happened? So I tried this recipe, and it tasted great! I love that it’s not too sweet. I ended up overcooking it (I think my oven runs a bit high), so it separated, and was chunky and runny. Fortunately, I doubled the recipe and refrigerated half to make later, and the second batch came out great. I turned the oven to 300 (instead of 325), and checked it often.